Guest Speaker Sir R. Salisbury, Principal Ms D. Gillespy and Dr E. Nodder, Salters Company. The Guest Speaker for the evening was Sir Bob Salisbury. Welcoming Sir Bob to St. Mary’s, Ms Gillespie said: “It is a privilege to have Sir Bob Salisbury as our Guest Speaker. A leading figure in the field of education, both locally and nationally, Sir Bob was Headteacher of Garibaldi School – a mixed comprehensive school in Nottinghamshire, England – between 1989 and 1999. Prior to the appointment of Sir Bob, Garibaldi School had experienced a range of challenges and difficulties. During his time as Headteacher, Sir Bob transformed Garibaldi School, motivating staff, engaging pupils and winning the confidence and support of parents and the local community. 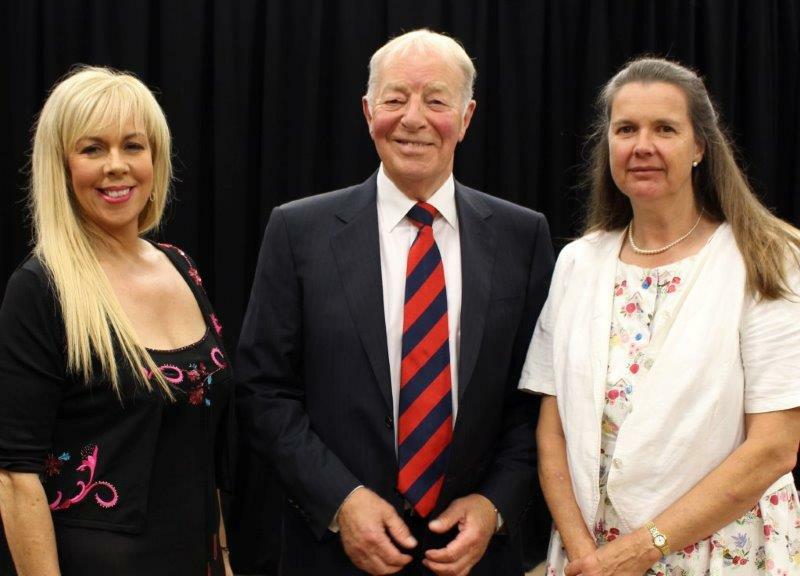 He set the school on a path of continuous improvement and achievement and, in 1998, Sir Bob received a Knighthood for his services to education.” Sir Bob delivered an inspirational address encouraging young people to develop independence, resilience and perseverance. Sports Captains: Anna Loughran (U16), Lauren Crozier (Ulster Junior A Colleges), Johnny McErlain (Rannafast Cup) & Anna Martin (U20), (missing from photo). Erin Forbes, Finola Bateson, Se Gallagher, Ryan Martin, Clodagh Gillen, Anna Mcgale, Erin Pickering, Grainne Mckee, Eimear Tohill, Aoife Quinn, Helen McPeake, Evelina McElhone, Caitriona Toner, Helen Doherty, Hannah Larkin pictured with Vice Principal, Mr F. Dunlop. John McMorrow, Jack Magill, Niamh McCloy, Anna McKee, Sean McKeefry, Emma McNally, Aine McPeake, Sile Murray, Mya Quinn, Aoife Walsh, Philip Baine, Catherine Byrne, Katie Cushley, Sean Hendry & Leah McKenna pictured with Vice Principal, Mr F. Dunlop. Eva Hirst (McKeown’s Jeweller’s Shield), Jack Magill (Brandon Construction Shield), Niamh McCloy (Lough Neagh Feis Shield), Anna McKee (McLarnon (Floral Bliss) Shield),Sean McKeefry (Tonagh Electrics (D’town) Shield), Emma McNally (Homecare (M’felt) Shield), Aine McPeake (Ulster Bank Shield), Sile Murray (Bank ofIreland Shield), Mya Quinn (Trustee Savings Bank Shield), Aoife Walsh(Coriprint Shield), Philip Baine (McErlean (Uniform suppliers) Shield), Catherine Byrne (Brian Tohill Shield), Katie Cushley (Cassidy Shield), Sean Hendry (McErlain (Bakery) Shield), Leah McKenna (Chambers Shield). Pictured with Vice Principal, Mr F. Dunlop. Vice Principal, Mr F. Dunlop pictured with joint recipients of The Margaret McAuley Trophy: Conor Bradley, Ethan Carey-Small, Mark Comer, David Cosgrove, Helen Doherty (Yr11), Thomas Doherty, Sarah Graham (Yr11), Karen Lagan, Conor Maguire (yr11), Niall McAuley (Yr11), Luke McCallion, Luke McCann (Yr11), Aidan McCluskey, Anna McGale (Yr11), Ella McKenna, Tom Muldoon (Yr11), Declan Murray, Luke O’Neill (Yr11), Callum Ormsby, Enda Quigley & Diarmuid Scullin. Mr F. Dunlop,Vice-Principal, pictured with St. Mary’s Cup winners: Karen Lagan (MonsignorWard Cup), Catherine Skelly (Staff Golden Jubilee Cup), Ciara Cassidy (Sr Marie Therese Cup), Meabh Cassidy (Holy Family Cup), David Cosgrove (McAvoy Cup), Luke McCallion (Duggan Cup), Ryan McKenna (O’Neill and McBride Cup), Maeve Shields (Past pupils Union Cup), Emma Taggart (Quinn Coach Hire Cup), Lauren Toner (Eamon Doherty Cup), Gemma Doyle (Fiolta Cup), Joseph Harper (Keenan Quarries Cup), Anna Loughran (Bank of Ireland Cup), Bláithín Rafferty (Michael McKay Cup), Diarmuid Scullin (Burns and Co. Cup). Conor Bradley& Callum Ormsby, First Trust Cup for English Language. Declan Murray Michael Donoghue Cup for Science. Declan Murray & Enda Quigley, Mary Donnelly Cup for Add Maths. Una Campbell, Sr Immaculata Cup for RE & The Hamilton Cup for German. Mollie Graffin, Sayee Family Cup for Art. Mark Comer, O’Halloran Cup for Drama. Conor McGarry, Corn Ui Chathain for Irish & the Mod Langs (Bank of Ireland) Cup for Top dual linguist St. Mary’s Cup Winners pictured with Vice-Principal Mr F. Dunlop. The Governor’s Cup, awarded to Top Student: (Joint winners) Conor Bradley, Emma Dace, Thomas Doherty, Orlaith Hegarty, Aidan McCluskey, Conor McGarry, Ella McKenna, Declan Murray, Callum Ormsby & Enda Quigley. Presented annually by St Mary’s to students who are leading House Champions in his/her house in Year 12: Conor Lynn, Mirren McKenna, Erin Walls, Conor McGarry & Thomas Doherty. Presented annually by St Mary’s to students who are leading House Champions in his/her house in Year 14. This year the award was presented to Anna McManus & Sarah-Louise Duffin. Additional winners include Matthew McErlean, Clare Mulholland & Jack Loughran. Magherafelt Market Trustees Cup Winner: Fearghal McKenna. Presented by the Magherafelt Market Trustees and awarded to the pupil in Lower Sixth who best displayed enterprise and entrepreneurship throughout Year 13. The Magherafelt Market Trustees have given a generous bursary to award winner Fearghal McKenna, pictured with Principal Ms D. Gillespie. Presented by B.P. McKeefry and awarded for excellence in Technology and Design B.P. McKeefry has given a generous bursary to award winner Thomas Doherty, pictured with Principal Ms D. Gillespie. Two trophies, presented by the McConville Family in memory of Joanne, are awarded to the boy and girl in Year 12 who, in the opinion of teachers, most consistently displayed kindness, consideration and friendship to other pupils in the year group. Principal Ms D. Gillespie presented Molly Graffin with the award on the night. Introduced in 2013, the Salt of Earth Award is presented annually by each school within the Magherafelt Learning Partnership to one student who has made outstanding personal efforts in serving the local, national and/or international community. The recipient of the award in St Mary’s was Hugh McKenna, pictured with Principal Ms D. Gillespie. This cup is presented by Principal Ms D. Gillespie, on behalf of the staff of St Mary’s and is awarded to a Senior student who has, in the opinion of teachers, most consistently shown care, compassion and consideration to other pupils. This year Eimear McKernan was the proud recipient of the cup. Presented by the staff of St Mary’s and awarded to a Senior pupil who has managed to successfully balance curricular and extra-curricular school activities. This year’s trophy was awarded to Conall Devlin, Tiarnach Donaghy & Adam Connolly by Principal Ms D. Gillespie. The 75th and 80th Anniversary Cups presented by the staff of St Mary’s and awarded to the Upper Sixth boy and girl who have made the most contribution to the community spirit of the school. Tiarnan McAteer was awarded the 80th Cup & Zoe McAllister received the 75th Cup. Pictured with Principal Ms D. Gillespie. Two trophies, presented by the McConville Family in memory of Joanne, are awarded to the boy and girl in Year 12 who, in the opinion of teachers, most consistently displayed kindness, consideration and friendship to other pupils in the year group. Principal Ms D. Gillespie was delighted to name Dannan McGroggan as this year’s recipient. Ulster All Star Awards – Camogie, Clare Mulholland. Clare achieved her second Ulster All-Star award in Year 14 for the second year running. Clare plays club camogie for Newbridge GAC and has been playing camogie since the age of five. Clare has represented St. Mary’s at both Junior and Senior level. Clare was thrilled to achieve this award and is very grateful for the coaching and support she has received during her time in St. Mary’s. Congratulations! Caoimhe plays her club football with Fr. Rocks, Cookstown and has been playing Gaelic football since the age of five. Caoimhe has also represented her county in Ladies’ Gaelic Football. For the third year in a row, Orlaith achieved her All-Star award. Orlaith plays her club football for St. Ergnats, Moneyglass and has been playing Gaelic football since the age of seven. She has represented St. Mary’s at Junior and Senior level.